The older I get the more I crave simple. The sweet, relaxed comfort of home cooking. An impromptu picnic on the patio with family-style classics like horseradish spiked potato salad. Instead of growing worldly and sophisticated and dabbling with truffle oil (a chemical taste beyond awful), each new gray silver hair spins my taste hula hooping into simplicity faster than Lady Gaga can waggle. Well, maybe not that fast. She is pretty nimble. But you get my drift. I'm whipping up ten-minute rice stir-fries, not Coq au Vin. I’m blending up pomegranate smoothies, not roasting Duck a l'Orange. And lucky me, the dawning summer season is all about simplicity. Who needs complicated and fussy when the farmers’ markets are abundant with glorious, fresh ingredients? Vegetables in every color. Ripe and voluptuous fruits. 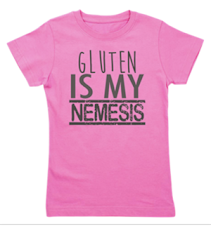 And every one of them gluten-free. And dairy-free. That’s the beauty of it. No imitation here. No game of let’s pretend. This is nature’s bounty, pure and raw and beautiful. 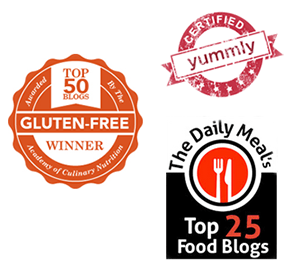 Recipe posted May 2012 by Karina Allrich. 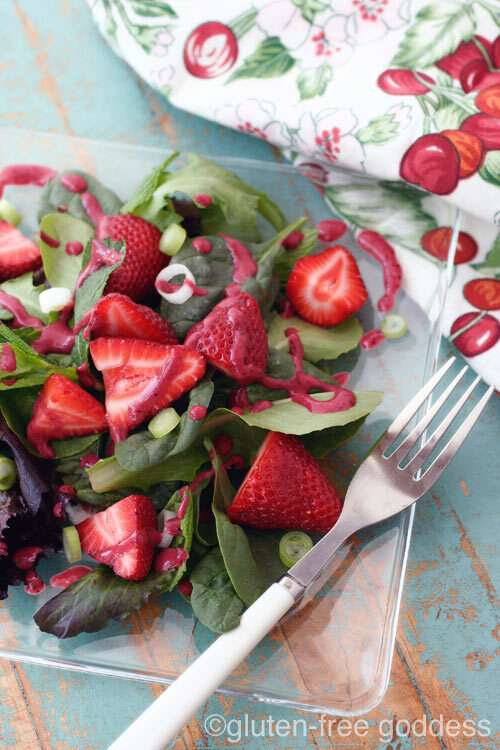 Using fresh summer strawberries in a vegan salad drizzled with berry and balsamic dressing transforms tender greens into a luxurious and romantic treat. And the best part? Easy as one-two-three. 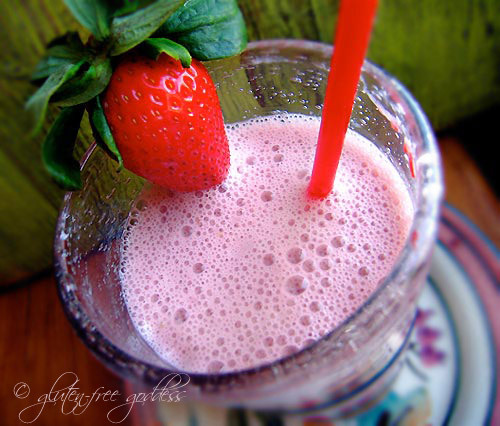 Place the strawberries, raspberries, balsamic vinegar, olive oil, and agave nectar into a blender container. Cover and blend on high until the berries are pureed. Season with a grind of fresh black pepper, to taste. In a salad bowl, toss the baby salad greens with the spinach leaves. Add in the strawberries and sliced spring onions. Drizzle with the Berry Dressing. Toss lightly. Serve with a mint sprig. 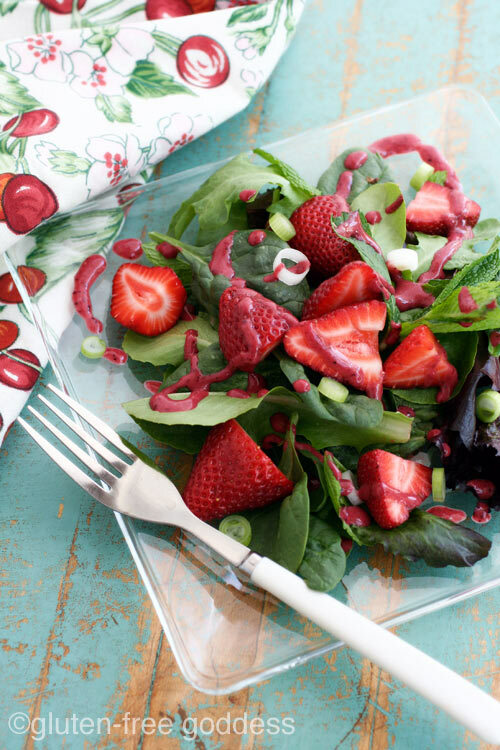 Karina's recipe for Strawberry Spinach Salad with Berry Dressing originally appeared in Allergic Living magazine.